The first phase of the new 204-apartment development, Birchfield, has been launched in Midrand’s new growth node, Grand Central. It is within walking distance of the Gautrain station, bus and taxi services with significant facilities and amenities in the area. The first phase comprises 60 prime one and two bedroomed units, affordably priced between R460,000 and R630,000 inclusive of all costs, says Seeff Sandton/Midrand Projects Director, Glen Fisher. This is a first for the area and follows on extensive research done to ensure that the location, product and price fit with the demand for affordable and convenient housing in the area, he says. This is an exceptional opportunity not only for entry-level buyers, but also for those looking for a convenient lock-up-and-go lifestyle with transport and conveniences literally on the doorstep. We anticipate a high level of investor interest as the demand for rental accommodation in this residential node is high and investors can capitalise on this, he adds. Birchfield is the start of a new urban lifestyle where residents can get by without a car and the associated costs, he says. The development is also in a low maintenance face brick to ensure minimal costs and the levies have also been kept as low as possible. Security is top class. The development is fully walled with electrified perimeter security, single controlled access, CCTV cameras and 24-hour linked armed response. There is secure under-cover parking for residents and additional visitor parking. Open lawn-areas provide space for children to play. The apartments range in size from 41,8sqm for a one bedroomed unit to 64,6sqm for a two bedroomed unit. 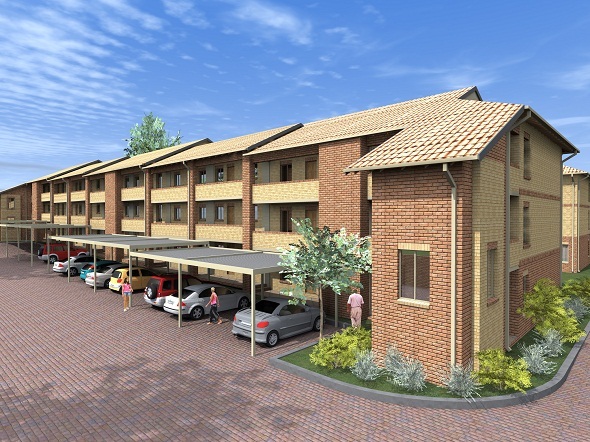 Prices start at R460,000 for a one bedroomed unit and at R630,000 for a two bedroomed unit. The interior finishes are modern and include fully fitted kitchens and built-in cupboards in the bedrooms. The one bedroomed unit has an open-plan living area and a choice of a bath or shower in the bathroom. The two bedroomed units have a full bathroom with a shower and bath. Grand Central is an exciting new CBD growth node for Midrand with excellent transport infrastructure and quick access to the New Road and Allandale onramps to the N1, says Fisher. It is strategically positioned between Johannesburg and Sandton to the south and Pretoria to the north and already has extensive commercial and hospitality businesses in the surrounds. Shopping malls, banks, medical care and schools are also nearby for residents. Aside from the existing infrastructure, there are more development plans afoot. Along with bus and taxi services, the Gautrain Rapid Rail Link runs from Marlboro to Centurion, thus providing wide access to other business areas for work. The Grand Central Airport is also nearby. The development is also across the road from the new Midrand Business Park that includes banks, shops, medical suites and more. A petrol station and 24-hour convenience store as well as the Absa corporate building are next door. The convenience, price and quality product on offer, makes this one of the most exciting urban residential offerings in the Johannesburg north area, says Fisher. The developers, VHB Developers and Construction have successfully developed fine residential complexes such as Waterford, Cottonwood, Tokara, Jasper Hill, Riverstone and Longview in Midrand since the 1990s and the development has been approved by the major banks, he says. We except that about 70% of buyers will be first time buyers for own use and the remaining 30% to comprise of investors given the anticipated rental demand and rental rates of R4,500 for a one bedroomed unit and R5,800 for a two bedroomed unit, says Fisher. Aside from buy-to-let investors, the development will also appeal to corporates in the area who need to accommodate staff and visitors.